This Halloween, I’d like to talk about werewolves, one of the classic monsters whose image helps to characterize this—my favorite—holiday. Werewolves, while sometimes overshadowed by the more frequent and high-profile appearance of other monsters such as vampires and zombies in popular literature, have a mythology that has endured for millennia and still finds a way to haunt our cultural imagination. When they have appeared in popular literature, werewolves often do so in the context of a prescribed, age-old struggle between their kind and vampires. Werewolf-vampire racial animosity is dramatized in the film series Underworld (2003), which injects an unlikely love story into the ancient war between these monstrous groups. This conflict has since become a regular feature of modern vampire films, such as in Van Helsing (2004) and What We Do in the Shadows (2014), and in TV series such as Twilight (2008) and True Blood (2008). Penny Dreadful (2014), a show which delights in Victorian monstrosities, also nods to this tradition when two werewolf characters (Ethan and Kaetenay) are forced to battle a gang of vampires, while Hemlock Grove (2013) alternatively features both a werewolf named Peter and a vampyric upir named Roman who share mutual respect and admiration. Vampire leader Viktor (Bill Nighy) battles werewolf in Len Wiseman’s ‘Underworld’ (2004). Generally whenever we see werewolves in modern popular literature, it is in this shared context, which is also true of the the TV series Being Human (2011); however, werewolves have (in a few cases) been given center stage. The classic and most obvious examples are the films An American Werewolf in London (1981) and An American Werewolf in Paris (1997). More recently, in Harry Potter and the of Azkaban (2004), Remus Lupin, who is one of the wizard professors at Hogwartz and also a werewolf, is a main protagonists in the film, despite that vampires feature nowhere in the series and are rarely mentioned even in J. K. Rowling’s novels. For Teen Wolf (2011), a TV series focused on a teenage boy’s struggle with lycanthropy, the absence of vampires is a point of pride. Often werewolves have been gendered male, but the TV series Bitten (2014) challenges this stereotype by centering the plot on a female werewolf protagonist and her struggles within a werewolf patriarchy. Unfortunately, and counterproductively, the series is plagued by a consistent hyper-sexualization of her character in a manner all too familiar from the modern vampire craze. I’d like to believe this inconsistent and contradictory messaging might have contributed to the show’s discontinuation in 2016, but somehow I doubt it. 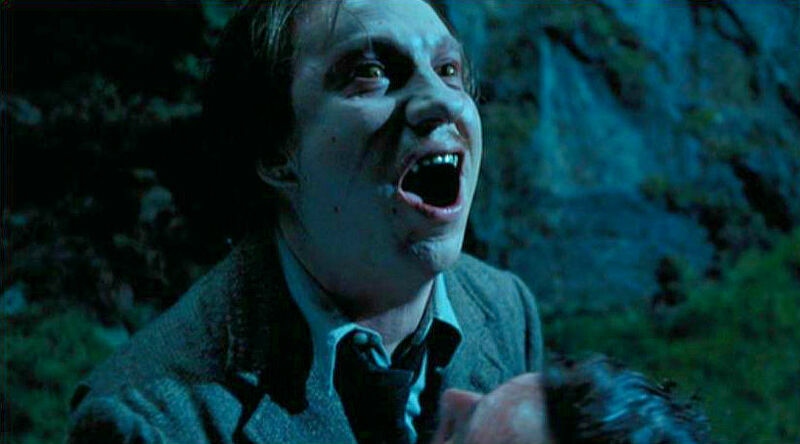 Professor Lupin (David Thewlis) transforming into a werewolf in Alfonso Cuarón’s ‘Harry Potter and the Prisoner of Azkaban’ (2004). Today, we will discuss skin-changing and werewolfism in the medieval literary traditions of Northern Europe, primarily as contained in the context of the Old Norse fornaldarsǫgur. We will also consider how lycanthropy in the Old Norse Hrólfs saga kraka and Vǫlsunga saga inform certain instances of skin-changers in modern literature, especially in the fantasy worlds of J. R. R. Tolkien and George R. R. Martin. Numerous academic blogs have explored the topic of lycanthropy, usually—and unsurprisingly—around this same time of year. In fact, the website Sententiae Antiquae has, in years passed, written a blog series on werewolves in the classical tradition, including blogs on Petronius’ werewolf story from Satyricon (62), Pliny the Elder’s emphasis on clothing and description of werewolf superstitions in his Natural History (8.80-4), and an overview of classical lycanthropy producing a list of sources including, Herodotus’ Histories, Plato’s Republic, Pausanias’ Geography of Greece, anonymous Greek Medical Treatises on the Treatment of Lycanthropy, St. Augustine of Hippo’s City of God, and the 11th century medieval Latin poem, Poemata 9.841, by a monk named Michael Psellus (which is notably influenced by Greek medical treatises). These blogs have tended to focus especially on classical superstitions, such as nakedness being a prerequisite for transformation and the belief that a wolf’s gaze could paralyze humans. Miniature of wolves and (below) the man paralyzed by their gaze from the ‘Rochester Bestiary’ in BL, Royal MS 12 F. xiii, f. 29r. The British Library has also composed a blog on lycanthropy in the context of the influence of classical werewolf mythology on later medieval literature. This blog references classical werewolf stereotypes primarily derived from Pliny’s description of versipelles ‘skin-changers’ (his term for werewolves) in Natural History, and then moves to consider especially Bisclavret, the famous Breton lay by Marie de France, and Gerald of Wales’ description of an Irish folktale concerning lycanthropy in his Topographica Hibernica, both of which present a very positive image of a werewolf, complete with the capacity for human understanding and compassion. Two werewolves and the priest from Gerald of Wales’ ‘Topographica Hibernica’ in BL Royal MS 13 B. viii, f. 18r. However, as mentioned earlier, werewolves appear also in the vernacular traditions of medieval Scandinavia, and this blog aims to expand the web-conversation surrounding versipelles ‘skin-changers’ in medieval literature to include examples from Old Norse saga prose literature, which contain numerous references to humans transforming into various beasts, usually wolves or bears. Gandalf (Ian Mckellen) speaks with Beorn in bear-form in Peter Jackson’s ‘The Hobbit: The Desolation of Smaug’ (2013). “She [Hvít] then struck him [Bjǫrn] with her wolfskin gloves, telling him to become a cave bear, grim and savage: ‘You will eat no food other than your own father’s livestock and, in feeding yourself, you will kill more than has ever been observed before. You will never be released from the spell, and your awareness of this disgrace will be more dreadful to you than no remembrance at all.’ Then Bjorn disappeared, and no one knew what had become of him…. Next to be told is that the king’s cattle were being killed in large numbers by a grey bear, large and fierce. One evening it happened that Bera, the freeman’s daughter, saw the savage bear. It approached her unthreateningly. She thought she recognized in the bear the eyes of Bjorn, the king’s son, and so she did not run away. The beast then moved away from her, but she followed it all the way until it came to a cave. When she entered the cave, a man was standing there” (37). This passage describes the power of the queen’s curse to physically transform Bjǫrn, which leads ultimately to his death at the hands of his own father and his warriors. However, it also emphasizes that, while Bjǫrn is dangerous to the livestock, he retains his humanity and at night transforms back into a man. Beorn in bear-form in ‘The Battle of the Five Armies’ by Justin Gerard (2009). 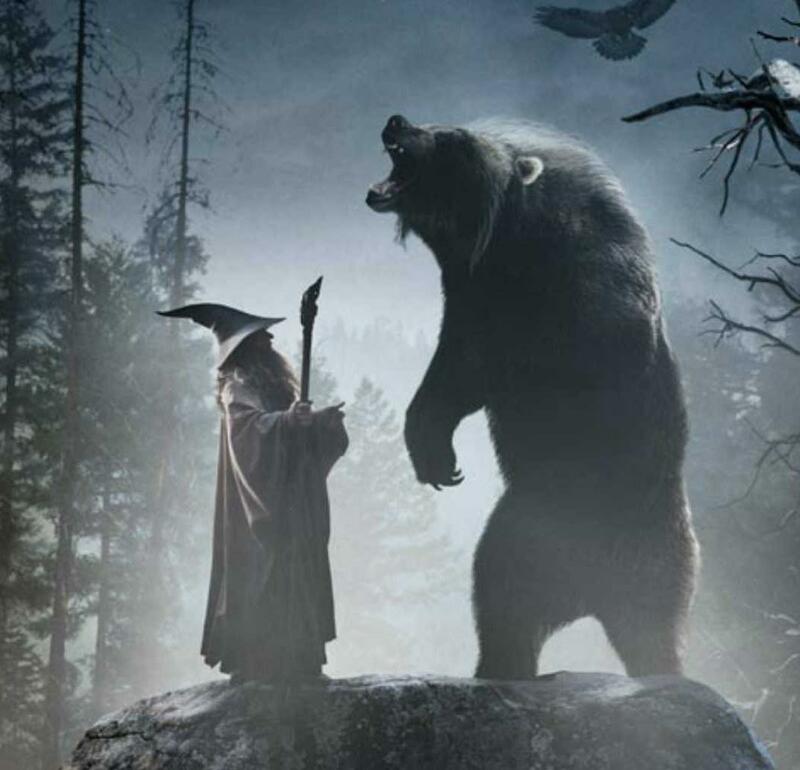 The character of Bǫðvar Bjarki, son of Bjǫrn (who too shares characteristics and some parallel achievements with Beorn from The Hobbit), also from Hrólfs saga kraka, trances and in doing so is able to inhabit the mind of a bear and control its actions. This is particularly crucial during the saga’s climactic battle between the monstrous army of Hjǫvard and Skuld and the forces of King Hrólf. The ability to enter into and take over an animal’s consciousness, as a form of shape-shifting through meditation, appears also in George R. R. Martin’s A Song of Ice and Fire (1991)—and corresponding HBO series Game of Thrones (2011)—in the contexts of characters called ‘wargs’ who possess this distinct ability. This group includes a number of those in the Stark family (whose family sigil is appropriately a direwolf). In Martin’s series, characters described as wargs are always from the wintry North, and regularly use their possessed animals to battle their enemies, as in Hrólfs saga kraka. 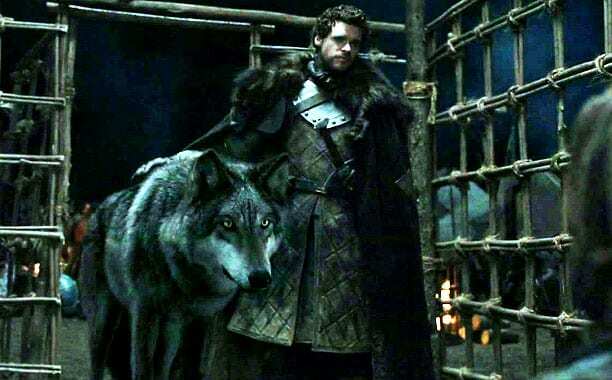 Robb Stark and his direwolf Grey Wind confront a captured Jaime Lannister in HBO’s ‘Game of Thrones’ (2011). ‘One time, they went again to the forest to get themselves some riches, and they found a house. Inside it were two sleeping men, with thick gold rings. A spell had been cast upon them: wolfskins hung over them in the house and only every tenth day could they shed the skins. They were the sons of kings. Sigmund and Sinfjotli put the skins on and could not get them off. And the weird power was there as before; they howled like wolves, both understanding the sounds’ (44). This passage describes the ability to ‘skin-change’ into a wolf by literally wearing a wolf’s skin. This version of ‘skin-changing’ is picked up and adapted in two of Martin’s fictional works: his short story “In the Lost Lands” (1982) and his novella The Skin-Trade (1988). Illustration of Grey Alys from George R. R. Martin’s ‘In the Lost Lands’ (1982). In Martin’s short story, a character named Boyce travels into the formidable ‘Lost Lands’ to the north, which constitute an endless frozen wilderness, with a witch named Grey Alys (who borrows heavily from mythology of Freya, especially with regard to her cloak of feathers). I won’t spoil the ending for those who haven’t yet and might be interested in reading this text, except to say that lycanthropy appears initially as a physical transformation, but by the end we learn that wearing the skin of a werewolf can produce the same metamorphosis for those whom the transformation isn’t biological. Cover of George R. R. Martin’s ‘The Skin Trade’ (1988). Similarly, in his later novella, The Skin-Trade, Martin establishes a world in which both biology and werewolf skin-wearing can result in lycanthropy. Werewolf fans may be happy to learn that The Skin-Trade is currently ‘in development’ by Cinemax under the direction of scriptwriter Kalinda Vazquez, who has written for other TV series such as Prison Break (2005) and Once Upon a Time (2011). However, particularly because there is currently no clear sense as to when Cinemax and Vazquez will have their version of The Skin-Trade ready for the silver screen, it may still be a while before there is a werewolf series to rival HBO’s True Blood or AMC’s The Walking Dead. Byock, Jesse. The Saga of King Hrolf Kraki. London, England: Penguin Books, 1998. Byock, Jesse. The Saga of the Volsungs. London, England: Penguin Books, 1999. Today, owls are usually associated with wisdom. Their depictions in modern iconography range from majestic hunters to cute messengers à la Harry Potter. The convention of associating these nocturnal birds with wisdom goes all the way back to ancient Greeks and Romans depicting owls with the goddess of wisdom, Athena/Minerva. However, owl symbolism has not continuously had such positive connotations; in fact, in Medieval England, they were drastically different. Owls have a strong presence in medieval fables and poems, many of them associating owls with the darkness and uncleanliness. 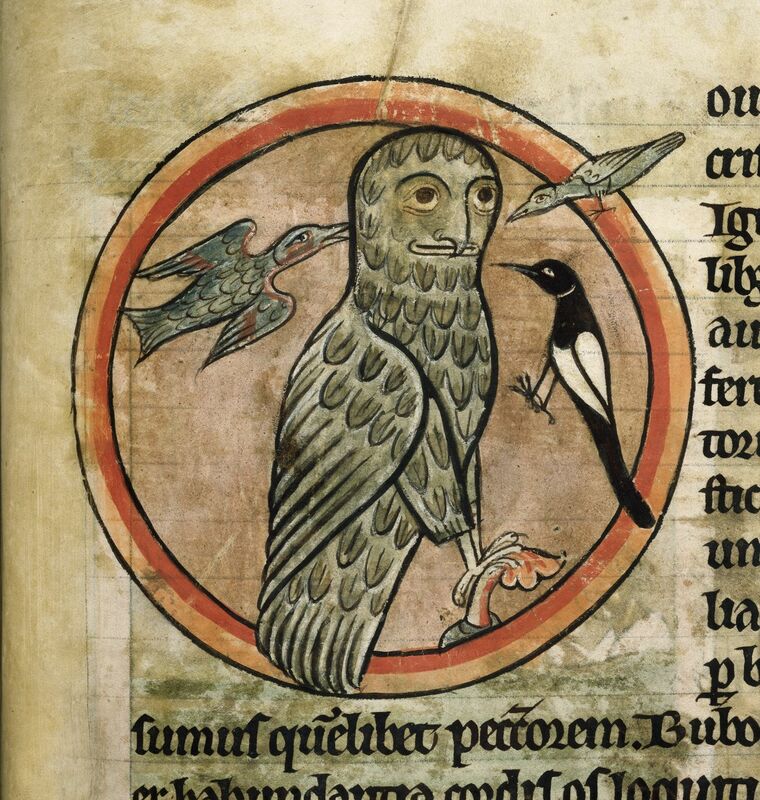 Medieval poets took biblical references to owls as inspiration. For example, Job in his sorrow is referred to as the companion of owls, linking owls with mourning. In Leviticus, owls are mentioned as unclean birds. Building on these negative associations, medieval beast poems include violence towards owls. In Cuono of St. Nabor’s fable “The Peacock and the Owl,” a white peacock, symbolizing light and goodness, is violently murdered by an “envious owl” (Ziolkowski 245), and then a violent curse is wished upon the owl to avenge the death of the beautiful peacock. 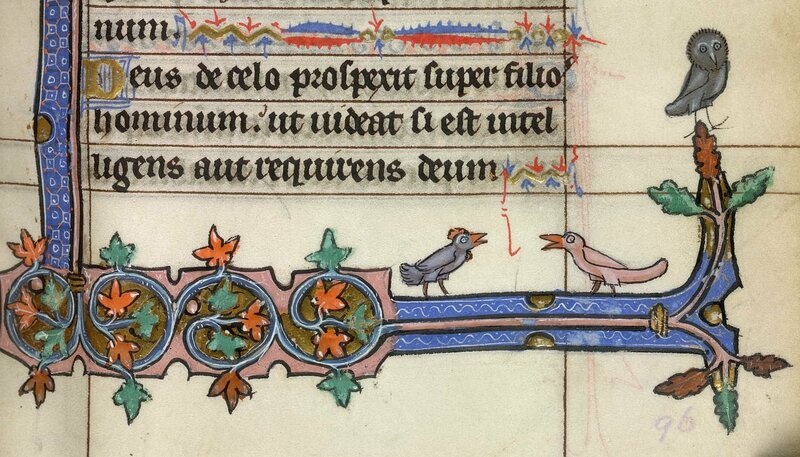 In the same vein, in the often-repeated story of the owlet in the hawk’s nest, the owl’s true identity is discovered when it fouls the nest—and then it is thrown out of the nest and dismembered by magpies and crows (Mann 178). A more disturbing element of owl’s negative symbolism is their association with anti-Semitism. Owls, who are day-blind and live in darkness, were used to represent Jews in medieval England, who were said to have rejected the light of Christ and live in the uncleanliness of religious blasphemy. This accounts for the anthropomorphic appearance of some manuscript drawings of owls: they were sometimes given hooked noses to resemble Jews, and their horns represent the horned hats Jews were forced to wear. Not all mentions of owls are completely negative, however. 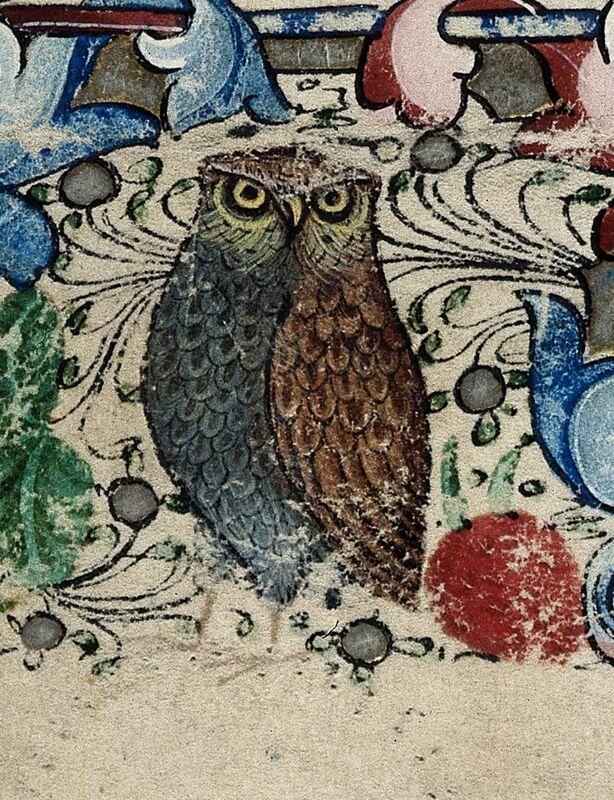 The Aberdeen bestiary presents a positive moralization of owls, saying that they represent Christ, who lived in the darkness (or away from view, like the owl) because he wanted to save sinners who also lived in darkness away from the light of God. One of the most well-know medieval literary owls is in the poem The Owl and the Nightingale. The Owl and the Nightingale offer retellings of some of Marie de France’s fables, illustrating the popularity of animal fables. Significantly, the Nightingale recites the fable of the owl in the hawk’s nest to emphasize the inescapability of nature over nurture: the owl is recognized because it can’t escape its unclean nature despite being raised by a different bird. However, the poem gives the well-known story a twist, turning the usual moral condemnation of the owl on its head. The owl counters that it cannot be at fault for a nature that is common to all infants—even humans. Owl symbolism continued to have negative associations even after the medieval period. During the Reformation, they came to be associated with Catholics, and later with Puritans (Hirsch 151)—generally with the vilified religious group du jour. Negative symbolism continued into the early modern period: in several of Shakespeare’s plays, the owl is an evil omen. Though the owl has much more positive connotations today, its history is plagued by darkness and negativity. Hirsch, Brett D. “From Jew to Puritan: The Emblematic Owl in Early English Culture.” “This Earthly Stage”: World and Stage in Late Medieval and Early Modern England. Brett Hirsch and Christopher Wortham, Eds. Turnhout, Belgium: Brepols, 2010. Mann, Jill. 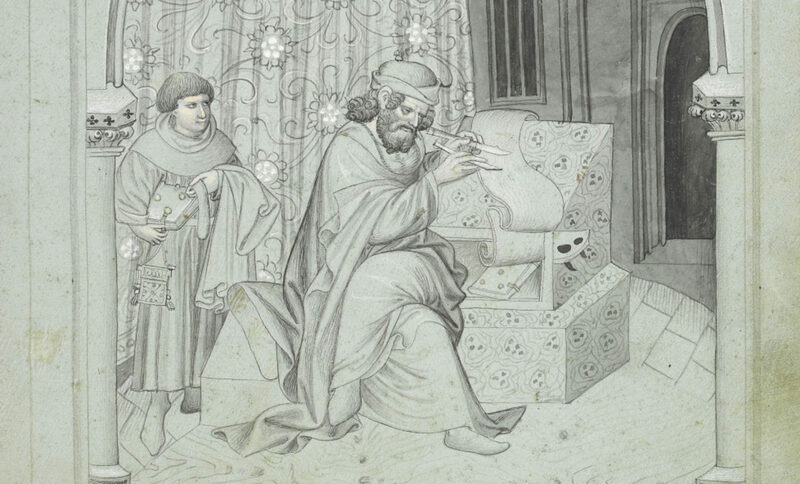 From Aesop to Reynard: Beast Literature in Medieval Britain. Oxford: Oxford University Press, 2009. Ziolkowski, Jan M. Talking Animals: Medieval Latin Beast Poetry, 750-1150. Philadelphia: University of Pennsylvania Press, 1993. Few mythological creatures have remained as present in Western cultural imagination as the fabulous and fiery phoenix. Phoenix mythology quickly became a poetic muse for classical authors from Ovid (Metamorphoses 15) to Lactantius (De ave phoenice). This mythographic and poetic tradition is later adapted in the Old English Phoenix, a poem found in the Exeter Book (Exeter Cathedral Library MS 3501). For my contribution to The Chequered Board’s ongoing series on Anglo-Saxon poetry in translation, I selected to translate a section from the Exeter Book Phoenix poem (lines 1-49), which I have titled “Æþelast Lond,” and which describes the heavenly home of the mythological phoenix. 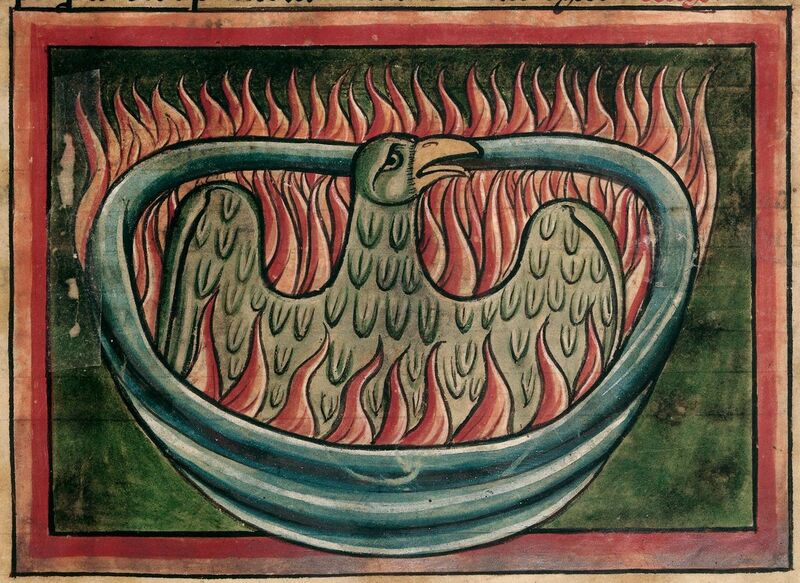 My translation of the Exeter Book Phoenix is—first and foremost—a “creative” adaption of the Old English original. As a translation, “Æþelast Lond” is an interpretive rendition of the Exeter Book poem and should not be taken as a literal translation of the Old English, but rather as an experiment with artistic translation as a means of interpreting Anglo-Saxon verse. Throughout the piece I try to remember the certain poetics specific to the Exeter Phoenix, in addition to the literary traditions of phoenix mythology and the mysterious paradise in which the phoenix bird lives. mid þam fægrestum foldan stencum. Purged of evil and impurity. And the fairest fragrance of paradise. The Exeter Book Phoenix is itself a translation of Lactantius’ De ave phoenice—from Latin hexameter into Old English alliterative verse—which I have here translated into modern English free verse. Anglo-Saxon poetic and homiletic styles work in tandem throughout the Exeter Book poem, as Janie Steen and others have long noticed. It can be noted that the first line of my translation “I have heard that hence in faroff dales” (1), metrically echoes, even mimics, the Old English alliterative verse structure. While there is a somewhat contrived, mechanical quality to this line, I wanted to begin by paying metrical homage to the original poetics, before swiftly departing from any strict metrical parameters. However, despite that only this line attempts to slavishly resurrect Old English metrics, alliterative adornment remains a consistent stylistic feature throughout “Æþelast Lond”. I attempt to resurrect the homiletic style of the Exeter Book Phoenix in my rather literal rendition of the ne…ne formulaic sections of this Old English “translation” (such as lines 15-19 and 22-25), which is in part an expansion on the nec…nec formula from Lactantius’ De ave phoenice. These formulae, Latin and Old English, are also popular in contemporaneous Old English and Anglo-Latin homilies. The cadence of this section in the original produces a masterful blend of Old English homiletic style and alliterative verse. For this reason, I felt this section deserved a more literal translation, with as much attention and adherence to metrics, style and diction as possible, in order to reproduce the rhythm and rhetorical effect produced by this simple, formulaic repetition. Moreover, diction—for any poet or translator—is a point that merits some brief discussion. Again, I begin with a higher frequency of words etymologically derived from Old English, such as “hence” (1), “folk” (4), “mold” (4), “winsome” (7), etc. However, by the ninth line of the poem, my diction shifts toward the Latinate and ecclesiastical, and terms such as “celestial” (9), “creation” (11), revelation” 12), “angelic” (13), etc., in order to reflect the spiritual concerns and homiletic tone of the Exeter Book original poem. The eastern wong or “plain” where the phoenix lives is heofon “heaven” in the Old English original, and thus in my translation, I focus my attention on the mystical space and mysterious home of the phoenix, central to this section of the poem. In the Exeter poem, two traditions of phoenix lore come together regarding where this mythical bird originates. The classical description of the phoenix as coming from the East (usually Egypt—at times India or Arabia) derives from Herodotus’ famous Greek account in his Histories, which lays the foundation for much of classical phoenix mythography. The Old English echoes this origin for the bird’s home: Hæbbe ic gefrugnen þætte is feor heonan/ eastdælum on æþelast londa (1-2) “I have heard that there is the best of lands far hence in the eastern parts.” The other tradition, which becomes syncretized with the classical accounts, comes from the Abrahamic tradition, and describes the phoenix as a bird of paradise. M. R. Niehoff has noted commentaries on the Midrash and Talmud, which describe the phoenix (chol) as refusing to eat the forbidden fruit and thereafter gaining everlasting life along with the chance to remain in paradise. The paradisal quality is present also in the Old English, as the phoenix’s home is a place not of this world: wlitig is se wong eall, wynnum geblissad/ mid þam fægrestum foldan stencum. “The plain is all shimmering, blessed with joys and with the fairest smells of the earth” (7-8). As Christianity developed during the late classical and early medieval periods, phoenix mythology became assimilated into Christianity, often recast in allegorical association with Christ and his resurrection. These allegories are often coupled with the Abrahamic interpretation of the phoenix as a bird of paradise, featured prominently in the Old English Phoenix. “Æþelast Lond” highlights Old English homiletic and poetic styles, combines Abrahamic and classical traditions of phoenix mythography, and raises questions about semantical versus literal translation. It is my hope that, rather than simply offering another slavish translation of the Old English, “Æþelast Lond” encourages others to engage their creativity when reading and translating Anglo-Saxon poetry. Stay tuned for additional forthcoming translations from the Exeter Book Phoenix, reborn as modern English poems! Hill, John Spencer. “The Phoenix.” Religion and Literature 16.2 (1994): 61-66. Niehoff, M. R. “The Phoenix in Rabbinic Literature” The Harvard Theological Review 89.3 (1996). ]: 245-265. Petersen, Helle Falcher. “The Phoenix: The Art of Literary Recycling” NM 101 (2000): 375–386. Steen, Janie. Verse and Virtuosity: the adaptation of Latin rhetoric in Old English poetry. University of Toronto Press Inc.: Toronto, ON, 2008.